Not to be confused with Riau Archipelago. The Riau Islands (Indonesian: Kepulauan Riau) is a province of Indonesia. It comprises a total of 1,796 islands lying between the Malacca Strait, the Karimata Strait and the South China Sea. The province is located on one of the world's busiest shipping lanes, sharing water borders with Singapore, Malaysia, and Vietnam. Originally part of the province of Riau, the Riau Islands became Indonesia's third-youngest province in September 2002. The capital is Tanjung Pinang and the largest city is Batam. The native inhabitant of the Riau Islands, called Orang Laut, formed the backbone of most Malay kingdoms from Srivijaya to the Johor Sultanate for the control of trade routes going through the Malacca Strait. After the fall of Malacca in 1511, the Riau islands became the centre of political power of the mighty Sultanate of Johor-Riau, based on Bintan Island, and were for long considered the centre of Malay culture. The origin of Riau Islands name comes from the name "Riau". Riau is allegedly derived from the word "riuh" which in Malay means loud or noisy. This is because the area of the Riau Islands was once a center of trade and crowd. Then this name developed with the use of the name Riau in the name of the Sultanate of Lingga. In the colonial period, the name Riau was changed to Riouw. The island of Batam, which lies within the central core group of islands (the Riau Archipelago), contains a majority of the province's population. Since becoming part of an economic zone with Singapore in 2006, it has experienced high population growth rates. Other highly populated islands in the Riau Archipelago include Bintan and Karimun, while the archipelago also includes islands such as Bulan and Kundur. There are around 3,200 islands in the province, which has its capital at Tanjung Pinang in the south of Bintan Island. The Riau Islands province includes the Lingga Islands to the south of the main Riau Archipelago, while to the northeast lies the Tudjuh Archipelago, between Borneo and mainland Malaysia; the Tudjuh Archipelago consists of four distinct groups — the Anambas Islands, Natuna Islands, Tambelan islands and Badas Islands — which were attached to the new province, though not geographically part of the Riau Archipelago. The 2015 census count was 1,968,313, less than estimated but it was still the second fastest growing province in Indonesia. With strategic geographical location (between South China Sea, Malacca Strait and Karimata Strait) and supported by an abundance of natural potential, Riau Islands is could possibly become one of the economic growth centers for the Republic of Indonesia in the future. Especially now that in some areas of the Riau Islands (Batam, Bintan and Karimun), a pilot project for the development of Special Economic Zones (KEK) is being pursued through cooperation with the Singapore regime. The implementation of the SEZ policy in Batam-Bintan-Karimun, is a close cooperation between the central government and local government, and the participation of the business world. This KEK/SER will be the nodes of the leading economic activity centers, supported by excellent service facilities and internationally competitive infrastructure capacity. Every business actor located within it will receive services and facilities of the highest quality that can compete with best practices from similar areas in Asia-Pacific. As an archipelago, climatic conditions are affected by wind. Riau Islands Province has wet tropical climate, there is rainy season and dry season interspersed with transition season with the lowest average temperature 20.4 °C. In November to February monsoon winds comes from the north and between June to December the monsoon winds comes from the south. During the northern monsoon the wind velocity at sea could range from 20-30 knots, on land the wind can range from 3-15 knots. This causes potentially extreme weather in Riau Islands with rainfall of about 150-200 millimeters and wave height between 1.2 meters up to 3 meters. From Srivijayan times until the 16th century, Riau was a natural part of greater Malay kingdoms or sultanates, in the heart of what is often called the Malay World, which stretched from eastern Sumatra to Borneo. Orang Laut inhabited the islands and formed the backbone of most Malay kingdoms from Srivijaya to the Johor Sultanate for the control of trade routes going through the straits. After the fall of Malacca in 1511, the Riau islands became the centre of political power of the mighty Sultanate of Johor or Johor-Riau, based on Bintan Island, and were for long considered the centre of Malay culture. But history changed the fate of Riau as a political, cultural or economic centre when European powers struggled to control the regional trade routes and took advantage of political weaknesses within the sultanate. Singapore island, that had been for centuries part of the same greater Malay kingdoms and sultanates, and under direct control of the Sultan of Johor, came under control of the British. The creation of a European-controlled territory in the heart of the Johor-Riau natural boundaries broke the sultanate into two parts, destroying the cultural and political unity that had existed for centuries. The Anglo-Dutch Treaty of 1824 consolidated this separation, with the British controlling all territories north of the Singapore strait and the Dutch controlling territories from Riau to Java. After the European powers withdrew from the region, the new independent governments had to reorganise and find balance after inheriting 100 years of colonial boundaries. Before finding their current status, the territories of Indonesia, Malaysia, Singapore, Brunei and Borneo struggled and even came into military conflict against each other, and the Riau islands once again found themselves in the middle of a regional struggle. The strong cultural unity of the region with Riau in the heart of this region never returned, and the line drawn by the British in 1819 remained, dividing the area into three new countries in 1965: Singapore, the Malaysian federation in the north, and Indonesia in the south. Some level of unity returned in the Riau region for the first time after 150 years, with the creation of the Sijori Growth Triangle in 1989. But while bringing back some economical wealth to Riau, the Sijori Growth Triangle somewhat further broke the cultural unity within the islands. With Batam island receiving most of the industrial investments and dramatically developing into a regional industrial centre, it attracted hundreds of thousands of non-Malay Indonesian migrants, changing forever the demographic balance in the archipelago. However, the upside of this demographic shift is that Batam is more multi-cultural and than how it was before, with a greater potential for better economic and educational development in future. Batam has become an industrial island with a booming tourism sector. There have been various attempts at both independence and autonomy for this part of Indonesia since the founding of Indonesia in 1945. As the closest neighbour of Singapore and to realise that Soekarno–Hatta International Airport is fully utilised, Lion Air is developing hangars in Batam Island and Garuda Indonesia is developing a new airport, with runway and maintenance facilities so as to make a new air hub in Bintan Island. The rate of economic growth of Riau Islands Province in 2005 amounted to 6.57%. The sectors that grew well (faster than the growth of total GDP) in 2005, among others sector, transport and communications (8.51%), manufacturing (7.41%), financial services, leasing and corporate services (6.89%), services sector (6.77%), and trade, hotels and restaurants (6.69%). GDP per capita in the Riau Islands province last five years (2001-2005) tends to increase. In 2001 GDP per capita amounted to Rp. 22.808 million, and in 2005 rose to become of Rp.29,348 million. However, in real terms (without taking into account inflation) GDP per capita (without gas) in 2001 only amounted to Rp.20,397 million, and in 2005 increased to Rp. 22.418 million. As an island province, 96% of the province is covered with ocean. This condition is very conducive to the development of aquaculture enterprises ranging effort to use seeding cultivation technology and fishing. In the Karimun Island, there are snapper fish farming and seaweed cultivation. In Batam, Bintan Regency, Lingga and Natuna also has huge potential in the field of fisheries. In addition to capture fisheries in four districts were also developed aquaculture sea water and fresh water. In the city of Batam, precisely in Setoko Island, there is even a grouper hatchery facility capable of producing more than 1 million seeds annually. In Batam, precisely the area of Telaga Punggur, there is a fishing port which is managed by a private company. Telaga Punggur Fishery Port was inaugurated on 8 January 2010 by the Minister of Marine and Fisheries R.I Dr. Ir. H. Fadel Muhammad. The layout of the fishing port private Lake Punggur very strategic for dealing with traffic lane fishing vessels between Riau Islands Province, and Natuna, South China Sea as well as the presence of the fishing port private Telaga Punggur in Batam very close with Singapore to boost the export of marine products, and add locally generated revenue. Almost all areas in the province of Riau Islands has the potential to be processed into agricultural land and farms given fertile soil. The agricultural sector is a strategic sector, especially in the district of Bintan, Karimun and Batam. Besides the crops, and horticulture, other crops such as coconut, coffee, Gambier, pineapple and cloves are very well developed. Likewise, in the district of Bintan and Lingga very suitable for growing fruits and vegetables. In some of the island is suitable for oil palm plantations. One of the largest oil palm plantation in the Riau Islands are in the area of Tirta Madu. A view from Nyamuk, Siantan Timur, Anambas Islands. Tourism in the Riau Islands is one of the main sectors that help advance economic growth in the Riau Islands, Indonesia. Natural wealth, art, and culture is one of the important areas of tourism in the Riau Islands. The Riau Islands Nature has a tropical climate, with 2,408 islands of which 30% are uninhabited. 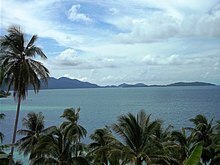 The Lower Island of Anambas Islands is included in Asia's best tropical island version of CNN. In addition, Sisi Beach in Natuna has also become one of the best natural beaches in the world by Island magazine in 2006. Penyengat Island and Bintan Island are also examples of tourist destinations in the Riau Islands. Batam City is the third major tourism gateway in Indonesia, after Bali and Jakarta. 2.25 million people or about 25% of the total number of foreign tourists in Indonesia entered through Batam. Riau Islands is also a pilot province of cross-border tourism in Indonesia for the city of Manado, Belitung, and the island of Borneo. In 2013, 1,859,066 foreign tourists visit the Riau Archipelago. This amount is up 5.18% from the previous year. The city of Batam became the main tourist destination. In second place, there is Bintan Regency followed by Tanjungpinang and Karimun Regency. The number of foreign tourists from Singapore is the largest of 51.23% of the total number of foreign tourists visiting. Followed by Malaysia ranked second with 14.72%. While other countries on average still about 5% consisting of China, South Korea, India, Philippines, Japan, UK, Australia, and the United States. Riau Islands became one of the coral reef conservation sites in Indonesia. Examples of coral reef conservation sites in the Riau Islands are Karang Alangkalam and Karang Bali. The wealth of marine life created the Natuna Sea into a scuba diving location. Beaches in the area include Lagoi Beach, Dream Beach, Trikora Beach, Nongsa Beach, Sakerah Beach, Loola Beach, Padang Melang Beach, Nusantara Beach, Leafy Batu Beach, Beautiful Beach, Tanjung Siambang Beach, Cape Coast, Melur Beach, Malay Beach, Pelawan Beach, Sisi Beach, and Pantai Cemaga. Riau Islands has 4 mountains namely Mount Daik, Mount Ranai, Gunung Sepincan, and Gunung Jantan. On the other hand, few other so-called mountains ( “gunung” is a Malay word for mountain) including Mount Bintan, Gunung Lengkuas, and others are actually not physically qualified to be called mountains because their heights are not tall enough to fulfill the criteria . Mount Bintan and Gunung Lengkuas are only hills, but because these hills are the highest point on the islands, they are calledmountains by the local community. Mount Daik and Mount Ranai are the 2 most frequently climbed mountains in the region. The hills are also a tourist destination in the Riau Islands. As an example from the top of Bukit Senyum in Batam viditors can see the landscape of Singapore.The Hill of Kursi on the island Penyengat, Tanjungpinang has a historic fort on it. Engku Puteri Plateau aptly describes the plateau topography on the top, Batam Center. In addition, there are several waterfalls to be found in Riau Province. These include Resun Waterfall, Waterfall of the Hereditary, Cik Latif Waterfall. These waterfalls have become parts of the tourism destinations in the Riau Islands. Natural water experience can also be felt by visiting the Blue Lake and the Mangong River mangrove forest in Bintan. Exploration of natural caves is also available in the Riau Islands, for example Goa Batu Sindu and Goa Kapal Batu in Natuna. The natural baths are also developed into tourist destinations such as Tengku Ampuan Zahara Baths in Lingga and Tanjung Hutan Hot Water in Karimun. Islam is the dominant religion in the province, with 77.51% of the total population identify themselves as Muslim. Other religions are Christianity, which forms 14.68% of the total population, Buddhism, which forms 7.51% of the total population, Hinduism, which forms 0.05% of the total population and Confucianism, which forms 0.17% of the total population. Village of Senggarang, an Orang laut village near Tanjung Pinang. Malay forms the dominant ethnic group of the province, with 35.6% of the total population identify themselves as Malay. The region is considered to be part of the Malay world. A subgroup of the Malays are called Orang laut. Orang laut are group of people who have a rich maritime culture, such as living in boats though in the present, many Orang laut have permanently settled on land. More broadly the term Orang Laut includes the various tribes and groups that settled on the islands and estuaries of the islands of Riau-Lingga, Tujuh Island, Batam Island, and the coast and islands off the coast of eastern Sumatra and the southern coast of the Malay Peninsula. Oarng laut are a tribe living in canoes or boat houses with major livelihoods as fish-seekers and other marine animals, such as sea cucumbers. Such subsystem economic models are the hallmark of their culture. Orang laut always hold a strong commitment to their honor and identity. They do not want to switch to other professions other than fishermen, they are also not interested in things related to the mainland. Most of the Orang laut populations till embrace animism but some of them have embraced the religion of Islam, although Islam is still mixed with the beliefs of their ancestors. Other ethnic group are mostly immigrants coming from different parts of Indonesia. Due to its proximity from Singapore, Riau Islands have become a melting pot for different ethnic groups coming from other parts of Indonesia. The Javanese is the dominant ethnic group of the immigrants, forming 18.2% of the total population. The Javanese who stayed here are mostly due to the Transmigration program enacted by the Dutch during the colonial period to reduce the overpopulated Java and continued until the end of the New Order. The Chinese-Indonesian is the third largest ethnic group in the province, forming 14.3% of the total population. Most of the Chinese-Indonesian in the Riau Islands are Hokkien, while significant Hakka and Cantonese community also exist. The language of the Riau Islands is known as Riau Malay. The Riau Islands are considered the birthplace of the modern Malay language, though it was the classical Malaccan Malay of the Johor court rather than Riau Malay that formed the basis of the standard language. Besides proper Riau Malay, there are several distinct varieties of Malay spoken in the province as well, especially those in Anambas Islands and Natuna Islands where they speak a form of Malay much more closely related to varieties of Malay in the eastern coast of Peninsular Malaysia like in Terengganu and Pahang as well as varieties spoken in Sarawak. Other languages spoken are Javanese, Sundanese, Batak and different varieties of Chinese, such as Hokkien, Hakka, Teochew and Cantonese. Waterfront City Ferry Terminal, Batam. Due to the fact that the Riau Islands is an archipelagic province located in an archipelagic country, water transport becomes the main type of transportation. Inter-island connections are often contacted by water transport. This type of water transport includes ferries, boats, boats, canoes, speedboats, freight boats, pompongs, tankers, roro ships, and others. This ship consists of a ship owned by Pelni companies and private vessels. The main ports are in Batam, Bintan and Tanjungpinang. The ports include the Port of Sri Bintan Pura, Bulang Linggi Port, Nongsa Port, Telaga Punggur Harbor, Sekupang Port, and Batam Center Port. These ports have domestic destinations to the fellow cities of Riau Islands, cities in Sumatra, Java, Kalimantan, and even Sulawesi. International destinations are also being implemented, especially destinations to Malaysia, Singapore, and some yachts or tours from Japan, South Korea, Taiwan, Hong Kong, China, Qatar, UAE, the Philippines, Brunei Darussalam, Thailand, Cambodia and Vietnam. Hang Nadim International Airport, Batam. Air transport is the second major type of transportation in the Riau Islands after sea transportation. Bad weather, strong waves, and a long trip made some residents, especially residents of Anambas and Natuna Islands prefer using air transport rather than sea transportation. Six of the seven districts and cities in the Riau Islands already have an airport. Riau Islands has two international airports, namely Hang Nadim Airport in Batam and Raja Haji Fisabilillah International Airport in Tanjungpinang. Both airports have international flights to Malaysia, Singapore, China and Russia. Domestic airports consist of Ranai Airport, Dabo Airport, Sei Bati Airport, and Matak Airport. This domestic airport is connected to other cities/regencies Riau Islands, cities in Sumatra, Java, and Kalimantan. Construction of other domestic airports in the Riau Islands is the construction of Tambelan Airport in Bintan and the construction of Letung Airport in Anambas Islands. Laksa Johor in Malaysia, similar to the one found in the Riau Islands. Cuisine in the Riau Islands are mostly similar to the one in Peninsular Malaysia, owing to its similar culture. There are also some dishes that is influenced by other parts of Indonesia, such as Java. Due to its cultural diversity, the people of the Riau Islands has developed a unique dishes that cannot be found in other parts of Indonesia. Mie Tarempa - Mie Tarempa or Mie Siantan are made from yellow noodles from wheat flour, eggs, sprouts and pieces of sea fish fried with chilli spices. It can be easily found in the Anambas Islands, as well as its surrounding area. Laksa - Laksa or Lakse in local dialect is a kind of noodle food mixed with typical Chinese and Malay spice blend. Lakse has a round white and slightly thick noodle shape. The name of lakse is taken from Sanskrit which has a lot meaning. It shows that lute noodle is made with various spices. Lakse in the Riau Islands presented in several kinds, one of which is a typical Anambas lakse which is included in the category of lakse curry with a fatty and spicy sauce and rich in spices. Sup Ikan Batam - One of the most typical mackerel soups of Batam, popularly known as the Batam Fish Soup (Indonesian: Sup Ikan Batam). This Batam Fish soup is served with a slice of mackerel fish that had previously been separated from its bones. This piece of fish is smeared with egg whites to remove the fishy smell, then cooked with spices and mixed with starfruit and green tomatoes. Pieces of white or green mustard greens are also incorporated into this soup. Nasi Lemak - Nasi Lemak is rice cooked in coconut milk and spices such as ginger and sometimes herbs such as lemon grass for extra flavor, served with the usual condiments including fish chili or belgie crackers. Mie Lendir - This food consists of yellow noodles boiled with sprouts, and eaten with a boiled egg that is halved. This noodle is then watered with a thick peanut sauce. Its thick peanut sauce that make this food named Mie Lendir. Mie Lendir is usually sold in the morning, so the people of Riau Islands make this noodle as one of their breakfast menu. Bak kut teh (肉骨茶) - A Chinese-influenced dish found only in the region as well as neighboring Singapore and Malaysia. Bak kut teh means meat tea bone. Bak kut itself is pork ribs, while the word teh, whicn means tea in Hokkien, comes from the dish brown sauce which is similar to the color of a tea. This gravy is a pork broth, with spices such as garlic and strong pepper. Teh Tarik - Tea Tarik is a tea mixed with sweet milk. Foam that decorate the top of the tea is produced by pouring this herb from one glass to another. Tea Tarik is usually served and enjoyed with nasi lemak. Lempok durian - Dodol typical of Anambas has a distinctive taste and more tasty than that made in Sumatra or Kalimantan. Made from durian and granulated sugar, this traditionally made lempok starts at Rp 100,000 for a quarter kilogram and can be bought at restaurants and food stalls spread out in Tarempa or Letung. Gonggong - Believed to be named from the Chinese water god Gonggong (共工), this dish is the main specialty of the province. This food is usually processed by boiling and then eaten with special sauce. In Kepri itself, these marine animals are found in the waters of Lobam, Tanjung Uban, Bintan and Batam. The nutritional content of gong gong is very high, even some people believe gong food gong is able to install growth hormone, and increase vitality. Kue Deram-Deram - Deram dream is a traditional cake typical of Malay which is widely found in Tanjung Pinang especially in Penyengat Island. This cake looks like a donut yan has a hole in the middle. It's just the size is smaller and of course the resulting flavor is different. Lendot - Lendot is a typical Malay food that has a savory taste and a little spicy. Lendot made from sago flour, spices and kangkung then given additional extras such as snails, shrimp, squid or other seafood. Lendot is usually eaten hot or warm. ^ a b "Riau Islands Province in Figures 2017". BPS Kepulauan Riau. Retrieved 23 July 2018. ^ Kepulauan Riau, Keberagaman Identitas dalam Kesatuan Kultur. ePaper Interaktif Kompas. 6 February 2009. ^ "Garuda Indonesia Create New Hub in Bintan Island". 11 February 2014. ^ "Riau Islands Province in Figures 2017". BPS Kepulauan Riau. Retrieved 22 July 2018. This page was last edited on 14 March 2019, at 18:57 (UTC).